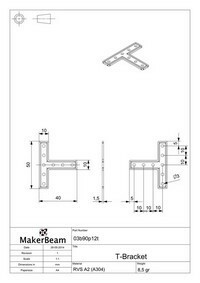 In this post you will find a link to technical drawings of MakerBeam and a number of brackets. A pdf with information on stiffness of the hollow core MakerBeam is also there. We regularly get the request for technical drawings to facilitate the design task. In this post you will find a link to technical drawings of (an older version of) MakerBeam and a number of brackets. The technical drawing of the beams shows the threaded variety. The MakerBeam version we sell now has a hollow core and threaded ends (8mm deep). You can find a pdf with information on stiffness of the hollow core MakerBeam in one of the folders in the drive.